A P0420 ODB2 check engine code or "Catalyst System Efficiency Below Threshold? code means that the your car has detected a problem related to the efficiency of your catalytic converter. Diagnosing a P0420 engine code is fairly straight forward once you understand how your car's exhaust and emissions systems interact. Your car has a catalytic converter in the exhaust system to control emissions. There are 2 heated oxygen sensors that measure unburnt fuel ratio in the exhaust. One is before the cat, and one after. The computer monitors the output of these sensors, expecting the front sensor to fluctuate more then the other. If these sensors report similar readings, the catalytic converter may be damaged or not correctly controlling emissions. If there are other engine codes present before the p0420 code such as a cylinder misfire, address those first. The P0420 code is usually accompanied with "Bank 1" or "Bank 2" which indicates which catalytic converter is causing the code. Bank 1 means the catalytic converter connected to cylinder #1. For inline 4 cylinder engines common on most passenger cars, there is only one bank. Vehicles with v6 or v8 engines have 2 banks of cylinders. In this case you may see bank 2 indicating the catalytic converter of concern is on a the 2nd bank of cylinders. Leaks in the exhaust before the catalytic converter can cause unexpected oxygen sensor readings. Listen and inspect for exhaust leaks near the exhaust manifold and piping leading up to the catalytic converter. The O2 sensors on each end of the catalytic converter should be checked for wear or damage. Be sure that the wiring is intact and securely plugged into it's wiring harness. The voltage of each sensor should be compared to verify the expected signals appear. The O2 sensor in front of the cat should fluctuate in voltage while the one to the rear should be more steady. Use a scan tool, multimeter, or oscilloscope to monitor the voltage from the sensors and compare them against the expected values. The graph shown depicts what a correctly functioning O2S11 and O2S12 sensor should look like. 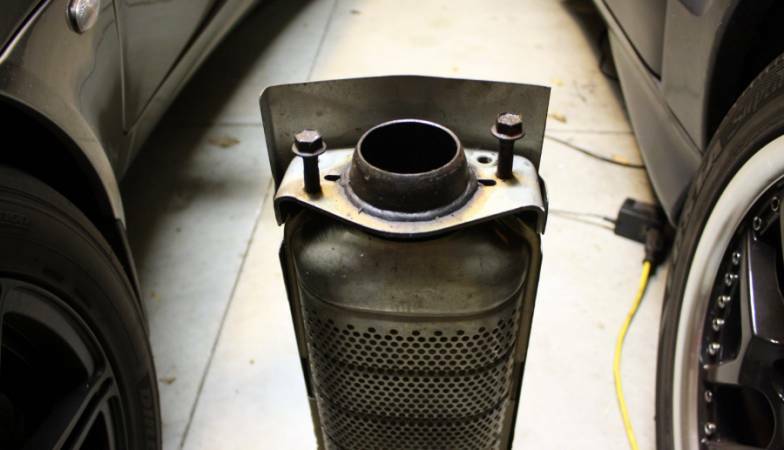 The catalytic converter converts unburnt fuel into less harmful gases using a honeycomb like structure of metal that reacts with the exhaust as it passes through. Like any other filter, as it ages it can get clogged and deteriorate. Catalytic converters go bad for numerous reasons. Too much fuel, oil, or coolant in exhaust. Check for damage or rusted holes in the cat's housing. Lightly tap a hammer (not hard enough to dent or dislodge the catalyst material) and listen for loose pieces inside. Check the temperature of the piping welds before and after the catalyst material using a infrared thermometer. If the rear is considerably hotter, there is too much fuel in the exhaust and the catalyst is working too hard, which will eventually cause it to fail. If the rear is lower then expected, it is likely that the catalytic convert is clogged or damaged.